Rest and recovery are critical components of any successful training program. This is the easy bit, but it’s often neglected. It is highly essential to recover both mentally and physically from a strenuous workout in order to keep your body strong and fit, without injury and people who underestimate the importance of after exercise recovery often do not have enough energy the next day. Without sufficient time to repair and replenish, the body will continue to breakdown from intensive exercise. Therefore building recovery time into any training program is an essential part of the process. 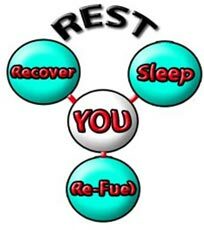 The most important in your rest and recovery period. Your body goes through a healing and growing process during this time. Eight hours of sleep is the ideal each night in order for your body to run efficiently. Deprive your body of sleep and you’ll have lousy fat loss and also have muscle loss. Adequate levels of sleep help to provide mental health, hormonal balance and muscle recovery. Without enough sleep the body stops producing anabolic hormones like testosterone and growth hormone which are muscle producing and fat burning hormones and starts increasing the production of catabolic hormones like cortisol which is muscle destroying and fat depositing hormone. Remember that when your body goes through a workout, it is not growing nor losing body fat, but instead breaking down. Only during sleep you get to lose fat and build the muscle. Your body needs raw materials to repair and restore bodily systems stressed by training. Eating clean and balanced meals is important to remain healthy, reduce muscle soreness and increase performance. If you are not eating enough protein, carbohydrates or deficient in potassium, an electrolyte which is essential for muscle contractions, then muscle soreness may take longer to heal, rebuilding of muscle tissue will not happen and your energy levels will plummet. When it comes to recovering, hydration is extremely vital. Post training there would be some level of fluid deficit and restoration of fluid balance will become important. Depending on your exercise choice, you might require water and an electrolyte replenishment drink. 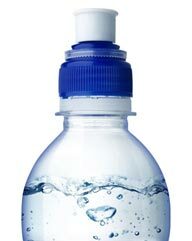 Drinking adequate water will flush out the toxins. It will increase your metabolism. It will regulate body temperature. It is critical for energy and performance. Water will help in efficient nutrient uptake. It will help in lubricating joints and not drinking enough water can cause the soreness to worsen and even cause muscle cramps. It is possibly the most effective answer to muscle recovery. It helps to relax the muscles after they work hard and helps to minimize the risk of cramps. During exercise a lot of pressure and strain is put on your muscles, tendons and joints. Stretching will improve the flexibility of the muscles and reduce any soreness from the exercise. It is the oldest method to speed recovery. It is used to increase blood circulation, reduce muscle fatigue, increase lymphatic circulation, enhances oxygen and nutrient delivery to fatigued muscles. Massage also increases removal of lactic acid and increases flexibility. In addition to the physical benefits, massage has been reported to help improve mood state and help increase relaxation and reduce feelings of fatigue. Bottom Line: The rest and recovery period is when EVERYTHING you want your body to do (build muscle, lose fat, get stronger, appear more “toned,” etc.) actually gets done. If you don’t allow your body to recover, none of this can happen. If your body can’t properly recover, your body can’t properly improve.